Most of Uptown New Orleans between South Claiborne Avenue or Earhart Boulevard and the river should receive historic-district protection against demolitions — with much stricter standards on St. Charles and Carrollton avenues, according to a unanimous recommendation Wednesday night by a committee of residents appointed by Mayor Mitch Landrieu. The vote by the members of the “Uptown/Carrollton Study Committee” is only the first step in a process that will play out in the months to come before the City Planning Commission and the City Council, officials explained at Wednesday night’s meeting. But the recommendation also gives a concrete starting point to the coming debate about which areas of Uptown need historic protection, and how much. Two new districts would be created, one for Uptown and one for Carrollton. Uptown’s would be bounded by Lowerline Street, South Claiborne, Delachaise and the river; Carrollton’s would be between Earhart and the river from the Jefferson Parish line to Lowerline in the university area and over to Nashville in Fontainebleau. Each district would receive a designated representative on the HDLC. In those districts, no structures could be demolished without permission from the HDLC. The HDLC would also investigate cases of demolition by neglect. Along St. Charles Avenue and Carrollton Avenue, the requirements would be much stricter (known as “full control”). In addition to demolitions, all new construction and all renovations would also have to receive HDLC permission. 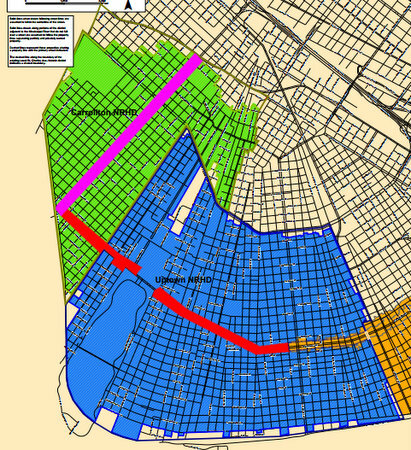 The proposed boundaries generally follow those of the Uptown and Carrollton National Register Historic Districts, but have been “smoothed out” so they will be easier for the public to understand, explained Elliot Perkins, director of the HDLC. Demolitions in most of the Uptown area are already governed by an entity called the Neighborhood Conservation District Advisory Committee. It is limited to making recommendations for City Council approval, however, whereas the HDLC decisions are final — unless someone chooses to appeal them to the City Council. City officials generally believe that having a single entity governing demolitions that can make up-or-down decisions is more efficient for residents than two agencies, one of which is necessarily a two-step process. The NCDAC didn’t have its own staff, as it was comprised of members of a number of city agencies and departments. Meanwhile, the HDLC would likely hire one additional person to help with the increased workload of the new districts, but “we probably need them anyway,” Perkins said. The study committee members had a series of clarifying questions for the staff, but generally agreed with the staff recommendations and offered little in the way of opinions of their own. The crowd of neighborhood representatives filling the VFW Post, however, did have a number of comments. In a comment later seconded by several audience members, historian Stephanie Bruno said she would support some control over new construction in Uptown as well. She also applauded the recommendation for full control over the upper portion of St. Charles Avenue, mirroring the protection over the older, lower sections. Jay Seastrunk, a board member of the Louisiana Landmarks Society, said he wished there was a sort of middle ground to full control — where the HDLC had review over the facades of buildings, but not necessarily every element visible from the street. “I see some terrible things being built that don’t have proportion. An effort to protect facades is something a lot of people might be open to,” Seastrunk said — rather than the kind of tight control over window materials that many people associate with the HDLC. Betsy Stout, a former Louisiana Landmarks Society board member, said she felt the more limited control over demolitions is a better role for the HDLC. Robert Hessinger of the St. Charles Avenue Association said his organization supported the full control proposed by the staff, even though he was personally surprised that the members wanted to give the city that much oversight over their properties. In the Twinbrook Neighborhood Association, president Jean Landry said her board hadn’t had made a decision yet, but she personally agreed with Bruno that some control over new construction in historic areas is needed. John McKnight of Gert Town noted that the Earhart Boulevard boundary of the Carrollton district runs right through his neighborhood, and said he felt his community had been left out of the discussion. Lauren Hotard said the HDLC staff might provide more professionalism to the demolition-review process. When her family sought to demolish a blighted home they bought from a neighbor, she said, the NCDAC board was ignoring her structural engineer’s reports and the city’s own code-enforcement inspectors and making judgments based on photos of the property taken from the street. Tom Longmire attended the meeting to call the entire process a farce, since the HDLC had voted to allow the removal of three monuments to Confederate leaders and one to a white-supremacist insurrection. Tim Garrett of Marlyville asked if a neighborhood or individual property could request not to be in the district. Perkins replied that the proposed boundaries could be easily altered to include or exclude any neighborhood from the district by either the City Planning Commission or City Council, but that gerrymandering the district lines around single properties would generally be frowned upon. Wednesday’s vote takes the issue out of the hands of the committee and sends it to the City Planning Commission for review. From there, the City Council will have the final decision — and public input will be taken at both of those points as well. “At every level, there are people listening,” Perkins said. Imagine that! The people handpicked by the mayor to be on this ‘committee’ voted unanimously to give the mayor exactly what he wanted. This is the same mayor that wants to destroy all the historic monuments… Is he taking his bipolar medications? He’s consistent, it’s folie de grandeur, he’s all about his personal power and control, he has a big family and lots of contributors to care for. Just another example of the mayor’s hypocrisy when it comes to history. The mayor found no problem in rewarding his political base by calling for the removal of the historic Alexander Doyle statues of Lee (1884 unveiling) and Beauregard (1915 unveiling). Both statues are in the register of historical places and understandably so as Doyle was one of the most prominent sculptors of his time. And despite your being led otherwise Lee had a significant connection to Confederate New Orleans as much as Martin Luther King had a civil rights connection to New Orleans. Lee was not only the commander of the South’s main army, the Army of Virginia. He was chief military adviser to Jefferson Davis during the much of the war and was general-in-chief of the confederate forces at the end of the war. His connection to New Orleans is as significant as Martin Luther King’s, who apparently also appears to have never set foot in New Orleans. I could find no reference of King ever being in New Orleans during the civil rights movement, but you will find a monument to him and a street and many other things named after him in New Orleans. And what about the other hypocrisies? The petition with thousands of signatures for preservation which was presented by the monument’s caretakers was ignored because some who had signed might not have been residents of New Orleans. Yet Wynton Marsalis was given Times Picayune front page coverage where he argued for the removal of the monuments shortly before the City Commission’s vote. I can assure you that as artistic director of Jazz at Lincoln Center New York City that Wynton is domiciled and a resident of New York City and not New Orleans. And it is because of the money and not because of racism that Wynton is in New York Wynton also wrote that we don’t put up memorials to losers, however, the Vietnam war memorial is a memorial to a lost cause, yet it is one of the most beloved national memorials. Wynton’s just say anything rant went on to praise so called local hero Andrew Jackson who with cursory inspection can be found to have not thought highly of both blacks and american indians. He further argued that our national myths and symbols should celebrate among other things courage under fire. Both the Lee and Beauregard statues are representations to many as military monuments that represent war dead who demonstrated courage under fire. This was pointed out at the Louisiana Endowment of the Humanities hearing by a history professor who noted that many people look at these memorials as a tribute to ancestral relatives who fought with courage under fire for the confederacy. The other members of the panel with their own agendas for removal did not hear a word the professor said. What about the argument that the statues belonged in a museum?Jarvis Deberry and others cagily kept referring to the Beauregard statue as being at the entrance to City Park. This statute is actually at the head of Lelong Drive which shortly leads directly to the New Orleans Museum. To get into the City’s open park area you have to turn off of Lelong Drive. And the city museum interestingly has a sculpture garden. Seems the statue fits right in with the museum. Jarvis went on to argue that a city that was mostly black should not have confederate war memorials. Interestingly, the Lee statue is at the entrance to an area of town which is overwhelmingly not black and the same could be said of the neighborhood of the Beauregard statue. I could go on and on with the hypocrisies of removal, but one further thing that should be said has to do with the evolution of thinking and institutions in America. Although in the Princeton controversy Woodrow Wilson could have been fairly called a racist, as president of Princeton he contributed to the school becoming a great university, which blacks and other minorities attend today. The point is that even though our founding fathers had slaves, their contributions to America have evolved to benefit all races. And the further point is that the Lee and Beauregard monuments have evolved with most Southern whites not looking at them as white supremacist monuments, but as military monuments to confederate war dead. This is not as Kevin Allman in The Gambit naively quoting Kirsten Savali who grudgingly said, “There is no Gone with the Wind fantasy to protect, only the desperate need of racists to hold on to fond memories of mint juleps, mammies, and black people as their property.” I nor do any other native white Southerners I know think of the monuments as representing white supremacy. Neither do any of us l know like mint juleps. Nor do any of us would have the least bit desire to own black people whose ownership expense would far exceed any benefits. And yes, there is a monument to Rommel in Germany. Just as there are monuments to their war dead in many other countries which lost their wars. So much for the Mayor’s concept of diversity in New Orleans, when he sets out to exclude native white Southerners with their ancestral ties to the South. Especially with the overwhelming majority of those white Southerners having no family ancestral history of slave ownership. In summary, Wynton, Jarvis, and the Mayor care nothing about how I feel about my Southern heritage, and I no longer care anything about how Wynton, Jarvis or the Mayor feel. So much for this discussion about race. Your astute comments about the sacrilege of our history are spot on, except as they pertain to mint juleps. Jarvis is Sharpton without the veneer of credibility, and Marsalis may as well start talking about macroeconomics, string theory, or some other subject he has no education or expertise in. However, I cannot walk with you to the julepless world you speak of. Thank you so much for your refreshing insights. Great reading. I plan to forward this on to all my friends who (like you) have had no say about what is historic in this city. And, yes, Rommel is honored for being the great military leader that he was…nothing to do with politics. This mayor and his HDLC lapdogs have absolutely no credibility on anything related to the field of history after their collusion to destroy some of our city’s greatest historical treasures. They have demonstrated quite clearly that the responsibility for preserving historical structures is above them. Radical liberals treat history as something to be erased and rewritten in the image of their utopian society. This is like hiring drug addicts to work at the pharmacy. Interesting bifurcated thinking from our Mayor with two brains. One brain argues for the preservation of the history of New Orleans and the other brain seeks to appease the New Yorker Wynton Marsalis’s by demolishing the historical Lee and Beauregard monuments. However, as any fool knows, the universal appeal of New Orleans has been its preservation of its past. Never going to happen on my watch. I’d sooner burn down my house. Are we supposed to believe that he wants to tear down all the historic monuments, but he cares about a few shacks. The HDLC has no credibility going forward in my opinion. I do not want them to now tell me how I may do with my house.